When performing long-term simulations, a method to model evapotranspiration is also selected in the GSSHA Job Control Parameter dialog box. The two methods available are Deardorff Method and Penman Method. The Deardorff method is a bare-soil evaporation model. The Penman Monteith method calculates the combined effect of evaporation and plant transpiration, and requires additional information on the plant community in each grid cell. 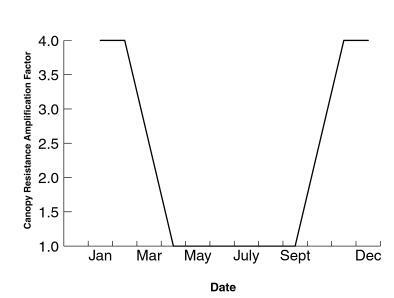 When the Penman method is selected, the option to vary the entered values of vegetation canopy resistance according to the season is available. When this option is selected, by toggling on the Seasonal Resist button, midgrowing season values of canopy resistance are entered and are automatically varied throughout the year as described in the GSSHA Users Manual. The canopy resistance varies as shown in Figure 24. Depending on the method of ET selected, the following distributed parameters are input through the mapping tables as described in Chapter 5. Values may be assigned based on field measurements, or from land use and vegetation information. Literature values based on land use, snow cover, and vegetation characteristics are compiled in the GSSHA User’s Manual. Land surface albedo – fraction of radiation reflected back to the atmosphere, range 0.0 to 1.0. Land surface albedo - fraction of radiation reflected back to the atmosphere (dimensionless), range 0.0 to 1.0. Vegetation transmission coefficient – direct solar radiation penetrating the vegetation canopy and reaching the ground, range 0.0 - 1.0. Canopy stomatal resistance– resistance of the canopy to transpiration at noon (s/m). This page was last modified on 23 June 2009, at 19:08.